I have a 2002 Nissan Pathfinder and was hoping to do a camping trip to the Kimberleys June and July 2009, I don't want to change vehicles if I can help it, so the question is, do you think this 4wd will have enough ground clearance? It's 200mm. Where exactly do you want to go? The Kimberley is a big place. I am sure I can find a track for you that will require more clearance :-). The Pathfinder is a reliable and "real" 4WD, not a "crossover" or "softroader". But of course I can't give any guarantees. I also don't know what the next wet season will bring. There are many variables that will in the end define where exactly the limit is. But rest assured that the limit would be somewhere well off the beaten track and certainly not along the Gibb River Road or in the Bungles or similar. People have done the Gibb River Road and all the gorges in VW campervans. I wouldn't recommend it, but at the right time of the year it's not impossible. When you see the sign or specification "high clearance 4WD" required, it means you shouldn't take a normal sedan or one of those crossover toy breads. 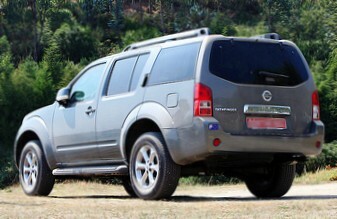 The Nissan Pathfinder is a real 4x4 and has considerable clearance. It's fine. If you're going up to Kalumburu or the Mitchell Plateau, do enquire about the current road conditions once you get there. This is something that everybody should do anyway, since nobody can predict now what condition a track will be in months down the road. The Pathfinder is a solid reliable vehicle for this kind of trip. I took my 1999 Ti through central Australia doing the classic tracks. Its capability was never challenged but it was thirsty and with a small tank we had to carry Jerry Cans. It went everywhere the Landcruiser and Patrol that were with us went. We ended up doing over 160,000 kilometers in that trusty stead and it never missed a beat or whimped out. Since then we have replaced it with a new Pathfinder Ti Diesel in 2007 which took us to Cape York with a Camper Trailer in tow. We did fit air bags in the back suspension to prevent the trailer weighing the rear down and we fitted a snorkel, alloy bullbar and a set of Mickey T's. It was a tough trip with our Cibie Lights falling apart from the corrugations on Battle Camp Rd. One Jerry can ruptured as well leaking diesel all over the back of the trailer but the vehicle itself performed faultlessly proving it's toughness. This Pathfinder is a more capable vehicle than it's illustrious predecessor. Again the range is limited because it has a relatively standard size tank but if you carry a couple of Jerry Cans (suggest plastic) or shell out the hard earned for a custom long range tank you won't have a problem. I would ensure you had good tyres as the standard rubber will more than likely let you down on this journey. If you put a set of Coopers, Mickey T's or BFG's on they will raise your ground clearance anyway. I would recommend you fit a snorkel. We are taking off to the Kimberley's in 2009 in our Pathfinder so let us know how you go. Have a great adventure. We 'did' the Gibb River Road and Kimberley area in 2005 in our then Nissan Pathfinder, towing a camper trailer, and we had absolutely no problems with our vehicle or camper trailer. In fact, we were so impressed with our Pathfinder, that when we traded our camper in on a semi-off road caravan, we upgraded our car to the current model diesel Nissan Pathfinder but only because of its increased ATM. They are comfortable and extremely reliable medium-sized 4X4 cars to do any trip in, as far as we are concerned. Love the website. I have a 2007 diesel Pathfinder and plan to travel Gibb River Road 2016 (in the dry), towing camper trailer. Is there a need to upgrade the suspension on the vehicle and, if so, should I consider air bags? "2002 Pathfinder has limiting fuel capacity"